A product manager challenged me to incrementally improve an existing internal tool, keeping the potential engineering points very small. He gave me the following constraints – I couldn’t remove any information from an already crowded search result list. I had to add two additional pieces of information, and I could not use progressive disclosure – all information/functionality had to be visible at all times. After I fought and lost the Get Rid of Information and Use Progressive Disclosure fights, I buckled in to work on a way to lay out this information and functionality in a way that would let the users quickly scan and act upon the data. Like most designers, I think in pictures. 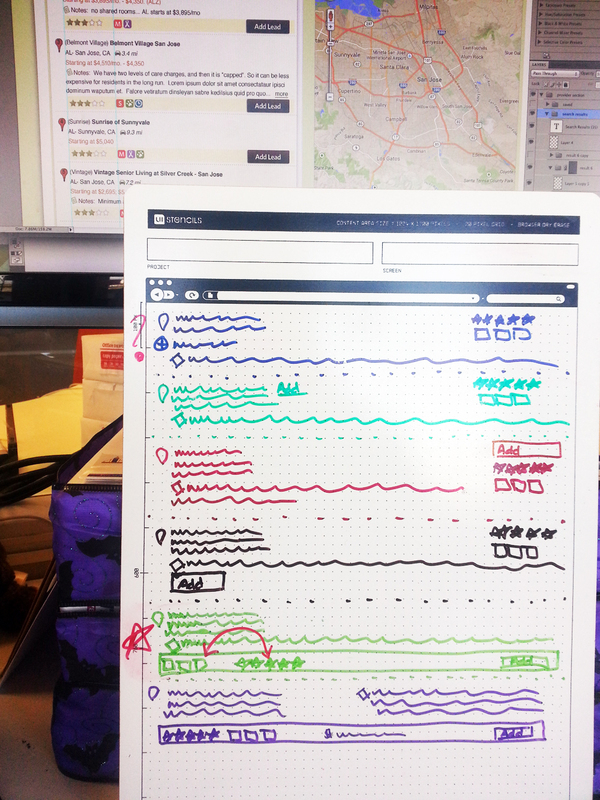 So, I whipped out my trusty UI Stencils Whiteboard and started sketching. I used different color pens for each option and just started drawing every single idea that came into my mind. I knew I couldn’t change things drastically, so I just pushed stuff around, played with encapsulation, played with methodology, and toyed with size and color. You can see the result of my design work in the back, comped in situ in the page where it lives. This may not be the final design – now it’s time to show it to my users and see if they can find everything they need to find in the list. I’d really love for you to take two lessons out of this. First, take the time to focus individually on every aspect of your page – even a list which takes up 25% of a whole deserves to be broken out of its context and explored in depth. Second, there is no replacement for the speed and flexibility of sketching. Since trees are a limited resource and tend to be much prettier when providing shade, save paper by using a whiteboard. Plus, then you can erase the crappy stuff and there’ll never be any evidence that you had an idea that bad. CompressPNG.com – This website is so slow that I actually forgot about it. BUT, it did compress a PNG from 756K to 250K with no loss of quality at all. Can’t shake a stick at that. Just upload up to 20 PNGs and walk away. Have dinner, come back, see compression. It’s a bad UX, but a useful tool. Brian Hazard is an old acquaintance and he’s been making music for ages. Color Theory is his one-man musical escapade, perfectly named to be designer music. Expect electro synth-pop for the old stuff, and slightly edgier, industrial shininess for the newer stuff. My favorite album is Sketches in Grey, which if I remember correctly is the first. But it’s probably not the best, it’s just the one I like most. Today I want to talk about something really, really important. I want to talk about screwing up. I do it. You do it. Everyone you know does it. We all make mistakes, forget things, try things that don’t work, or otherwise fling poo at our batting average. It’s important that we admit that, and accept it, and plan for it. That “plan for it” part is the hardest one, and it’s the one I want to focus on. Because you should be focusing on it too. People in a creative role are not flawless. Whether that’s a design role, product management, or development, they miss little details from time to time. They work long hours and forget to close a tag. Or they try something that research or instinct tells them will work, and it doesn’t. It’s only through these mistakes that they learn and get better. And it’s only through taking risks that they can discover the insights it takes to win big. We’ve all been in companies where there is a “bozo switch” with a hair trigger. If you do one thing less than perfectly, they’re going to think you’re an idiot for the rest of your life. Screw up once, in a small way or a big one, and you’ll never be given the chance to succeed again. How did you feel there? Were you energized, enthusiastic and ready to take the risks needed for big successes? No, you were downtrodden, over-cautious and looking for the first opportunity to leave the company. And I guarantee the company suffered for it, because they didn’t get your best work. I’m not saying that someone who is wrong every time they make a statement should continue to get the benefit of the doubt. But allow people to be wrong, let’s say, up to 33% of the time without assuming they’re incompetent. No one has a hundred percent success rate at anything – even Bobby Fischer lost games sometimes. If someone is wrong so often that you find yourself having a hard time believing in them at all, then maybe they haven’t got the tools they need to succeed. Ask them. If they’re wrong less than a third of the time, they have a good track record and you should give them the benefit of the doubt. When something breaks, it’s important to know who broke it. That way, they can feel good about themselves by fixing it. Also, you can identify issues with process or opportunities to improve skillsets. However, it’s not important to assign fault, shame the person who made the mistake, or levy consequences. Again, if every time a person touches your code it crashes the website, maybe you want to see if they have all the tools and knowledge they need to do their job. But if a person writes code for you for a year and then one day breaks the build then you should figure out why and help them, not ridicule them. The best way to create an environment where it’s safe to mess up occasionally is to show that you aren’t perfect. When you make a mistake, own up to it in front of the team. Take responsibility, and be an exemplar. Don’t lose confidence in yourself, either. It takes a strong person to admit they’ve messed up, and a stronger person to follow through on the fix. Your team will admire your courage and honesty and they’ll know that they are safe to do the same. I’m not saying that you should create a “Most failed experiments” trophy or anything. But the best way to create a close, trusting environment is to bring a little humor in. It’s ok to laugh when something flops. It’s ok to gently tease each other, to have friendly competitions and chuckle while you’re cleaning up the mess. Laughter is, after all, the best medicine. When you’re planning, plan a fudge factor in. I tell my team to use the Scotty Principle – multiply the time you think it’ll take by 3 and that’s the estimate you give. In every sprint, add some points for fudging. Have multiple people check your work. Have a backup plan. A/B test. If you assume that some experiments will fail, then you’ll be ready with alternatives. Be like the Buddha, and accept failure before it even happens. Heck, count on it and figure out what you’ll do WHEN it happens. If you apply these principles to your product organization, and maybe even to your life, you’ll find that it’s less scary to take risks. After all, as long as the risk is a calculated one, and you have a disaster mitigation plan, there’s a ton of upside and the downside is manageable. Life is really just a series of iterations, day after day. Some of the iterations are improvements, and some aren’t. But the universe didn’t give up on you when you didn’t get the relationship with your high school sweetheart just right. It gave you endless second chances, and you’re clearly still getting second chances since dead people don’t read my blog. (Or maybe they do. If you’re dead and you’re reading this right now totally give me a call so I can write a book about you!) Create an environment full of second chances, and your product and your users will ultimately thank you for it. Random User – Such Tool! Much Helpful! Many Fun! And other Dogespeak! This is an elegant little API that generates random user info for use in your designs. The applications are only limited by your imagination. Another oldie but goodie is Deep Forest’s Boheme. It makes me think of browns and oranges, and makes me want to use rich textures. It’s smooth but just energetic enough to make it hard not to sway around. Apply at very high volume for best effect.